WASHINGTON/CHICAGO (Reuters) - U.S. President Donald Trump on Monday urged Boeing Co to "rebrand" its 737 MAX jetliner following two fatal crashes, but the planemaker said it was focused on fixing the problem and brainstorming over next steps to win back public trust. 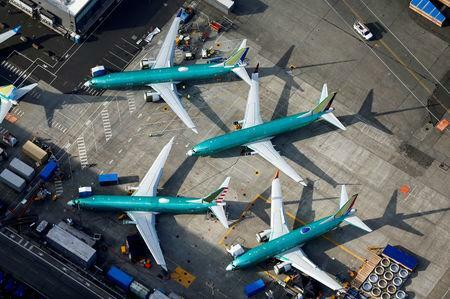 Airline officials said they have held lengthy meetings with Boeing over the past weeks about how to regain the public's support once the grounded planes are returned to service. A full rebranding of the MAX was not likely, according to a person familiar with Boeing's thinking, who noted that renaming an aircraft is a significant undertaking. Asked about Trump's advice, delivered in a Twitter post, a Boeing spokesman said rebuilding public trust was their focus, with pilots playing a pivotal role. "Pilots' confidence in the aircraft will lead passengers and crew to have greater confidence in the aircraft," Gordon Johndroe, vice president for communications, told Reuters. For now Boeing is concentrating on submitting a software update and finalizing pilot training for regulatory approval. Regulators worldwide are preparing to review Boeing's proposals. Trump, who owned the Trump Shuttle airline from 1989 to 1992 and is an aviation enthusiast, weighed in with his thoughts early on Monday. "What do I know about branding, maybe nothing (but I did become President! ), but if I were Boeing, I would FIX the Boeing 737 MAX, add some additional great features, & REBRAND the plane with a new name. No product has suffered like this one. But again, what the hell do I know?" he tweeted. The 737 MAX is Chicago-based Boeing's fastest-selling jet and its main source of profits and cash, having won some 5,000 orders or around seven years of production for the aircraft. Chief Executive Dennis Muilenburg has apologized on behalf of the planemaker for the 346 lives lost in accidents in October and March, and promised to eliminate the risk that flight software meant to prevent the plane stalling could be activated by wrong data. "Passengers will be thinking about the pilot that's flying the plane. We are the real final call," said Dennis Tajer, spokesman for the U.S. Allied Pilots Association. Trump's tweet marks the first time the MAX brand underpinning Boeing profits in coming years has publicly been thrown into question by a senior government official. How Boeing recovers from this blow to the fuel-efficient, single-aisle MAX will be key to its duopoly with European planemaker Airbus SE, since Boeing is years away from being able to deliver a new narrowbody model, experts said. The plane's grounding has also threatened the U.S. summer travel season, with some airlines removing the 737 from their schedules through August. Brand Finance, a UK-based consultancy that tracks the value of global brands, said on Monday it sees a $12 billion dent to the value of the Boeing brand, which it had called the most valuable in the aerospace industry worth $32 billion in 2018. Brand Finance Chief Executive David Haigh rejected the idea that Boeing should rebrand, noting that Toyota and others recovered from high-profile crises without a drastic rebranding exercise. Boeing's 787 Dreamliner got off to a rocky start after a battery issue that led to a temporary grounding, but the plane has gone on to become a popular aircraft in the widebody market. "This is a temporary blip in the long run for Boeing," Haigh said by email when asked about Trump's comments. Other marketing experts said talk of rebranding was inappropriate when the issue of safety was paramount. "To rebrand without making sure the product is safe and undergoing another crash with the same airplane under a new name and image could destroy Boeing," said Paul Caiozzo, founder and Chief Creative Officer of brand design agency Interesting Development. Thomas Ordahl, chief strategy officer at brand consulting firm Landor, which works for airlines and other sectors, said: "You can’t just rebrand, you have to deal with the problem."